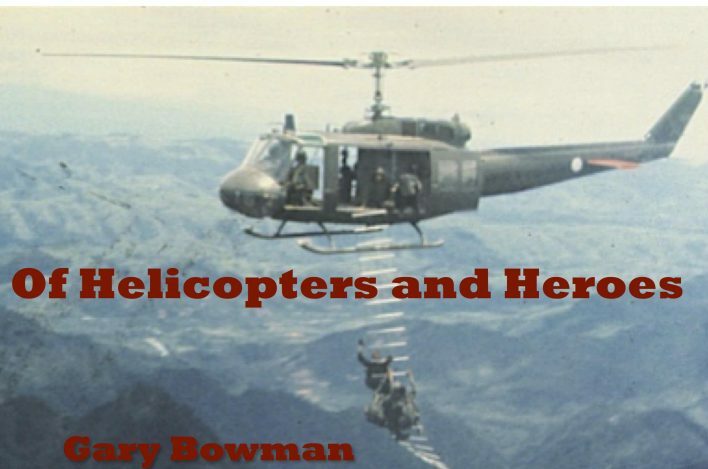 This fall Gary Bowman of Loveland, Colorado, completed Of Helicopters and Heroes, a fictional account of a Huey helicopter crew chief’s one year tour in Vietnam. Inspired by real events, it includes photos and after-action reports to document the work’s historical accuracy. “It’s way too close in here,” Tim Burroughs thought. The river was about one hundred feet across, meandering in slow, wide, winding arcs. Trees and vegetation that grew tall, broad, and dense on both sides provided the eons-old river with a canopy that blocked out most light and caused it to appear a dark, murky green. The sun shone intermittently through the foliage, dancing off of the ripples on the water in fluttering bright flashes ─ a stark contrast to the green twilight enveloping the crew. The Huey sped along through this verdant passage at roughly eighty knots, Burroughs guessed; its skids were barely three feet off the river’s muddy surface, twisting and banking with every turn that the ageless, slow river made. The canopy was just high enough to allow the helicopter’s rotor blades to clear without trimming the leaves and branches as she banked. It was remarkably quiet, the trees absorbing most of the noise that the helicopter made except for the loud whopping when they banked for a turn. It was too quiet. Surreal in its entirety. The trees sped by in a blur. Burroughs felt his side of the helicopter lift as they made a right bank. It seemed a sharper curve than the others they had encountered. He could look out the left side of the aircraft from his crew chief seat and almost see straight up through the canopy without raising his eyes. “This isn’t right,” his subconscious told him. . .
What else his subconscious told him and his conscious mind experienced is presented in this 180-page well-crafted tale offering a compelling narrative of challenge, hardship, and survival. A soldier’s humor balances the grimness of what had to be done. Printing of the final product was made possible by generous donations from the Piedmond Area Veterans Council (Farmville, Virginia), the Longwood University Foundation, and generous individuals in the community.